MyPlate, the new portion guide released early this summer, aims to teach healthy eating basics. The government converted the former USDA Food Pyramid to a portioned plate to make following dietary guidelines easier and more user-friendly for Americans. The idea of proper portion control, however, is nothing new. But if the key to healthy eating is so simple, why are two-thirds of Americans overweight or obese? Our culture has come to be characterized by complete lack of control and confusion. Just as having too many material goods can rob each one of their value, eating too much can erode our ability to derive pleasure and satisfaction from food. Overeating works like a drug in the body: Excess energy intake stresses out your system at every level. If we are to realize our full potential and create a safe environment for our children, we must stop allowing ourselves to be victims of food pushers. We must find a new path to healthy bodies and minds. MyPlate reinforces this portion idea that "less is more." It emphasizes balanced serving sizes and visual portion control. Being portion savvy will teach Americans to plate their food in the kitchen, preventing huge portions and second helpings. This naturally causes mindful eating and frees up time for more fun with the family. Let's take a closer look at how this new plate differs from the original food pyramid, which included the four food groups stacked in the shape of a pyramid with the number of recommended servings a person should eat from each group in a day. Since fruit can be high in calories, it's important to watch portion sizes. Berries are a great choice, lowest in calories and full of antioxidants. 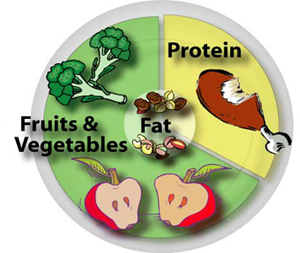 MyPlate considers beans as part of both the vegetable and protein portion of the plate. This highlights the fact that vegetarians consume beans as a protein choice, but more Americans should include beans in their diet. For adults, the recommended daily allowance for protein is 0.8-1.0 grams of protein per kilogram of body weight (about 80 grams for a 175-pound person). MyPlate fails to recognize other grains such as lentils, quinoa, brown rice, oatmeal, and bulgur as additional protein sources. There is no section of fats shown on the plate. Unlike the Food Pyramid, which suggested Americans include them in their diet "sparingly," MyPlate has taken them out of the picture.